With the sun low in the sky and winter’s chill in the air, you couldn’t pick a better time to visit the fjords of Norway. The summer crowds have long since gone, leaving you to savour the silence of the mountains along snow covered trails, and to explore the cobalt blue waters of the fjord under the haunting low light. Add in a Norse viking Brew pub, cosy fireplaces and fabulous food and you have all the ingredients for a very special stay in Norway. Arrive into the scenic town of Flam and transfer to the Flamsbrygga hotel, your home for the next three nights. Overlooking the shoreline, surrounded by magnificent mountains, this welcoming hotel boasts a distinctive blend of traditional and contemporary styling and is home to the Aegir craft brewery and pub. Inspired by Norse mythology, with the exterior reminiscent of a stave church, step inside a world of drift wood walls, dragon heads and imposing fireplaces. Award winning beer, brewed onsite, is served alongside a menu created from the finest local ingredients. Spend the evening on a gentle and pleasant cultural evening walk through Flam and some of the surrounds. 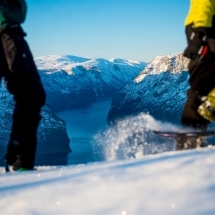 Enjoy Flåm by night, the still fjord and fresh winter air. You'll be accompanied by a knowledgeable guide who will tell stories and provide a unique insight into the local history and culture of the area. Away from the lights of the town watch the stars shine and twinkle in the sky on a dark and quiet winter night. Finish your evening in the Aegir BrewPub. Enjoy the burning fire, the cosy atmosphere and Aegir Viking plank – a Viking-inspired 5 course beer and food menu. Today spend some time on the water with a 2.5 hour fjord safari in an open Rib boat. 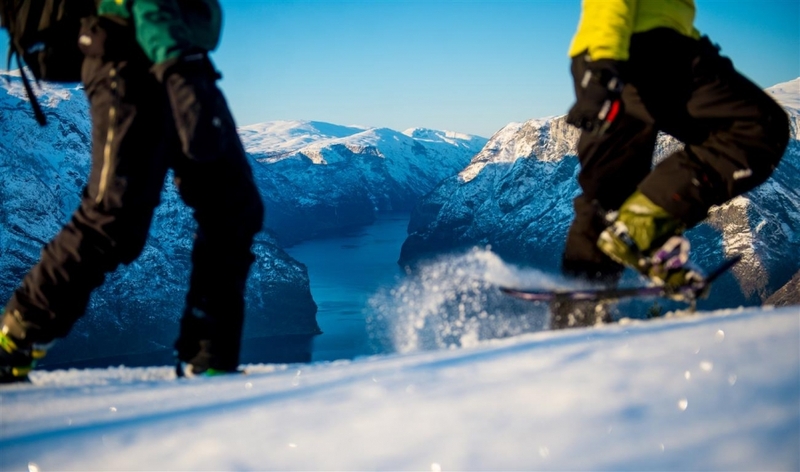 Experience the magical Norwegian winter fjords surrounded by snow covered peaks and frozen waterfalls. Enjoy the breathtaking scenery and listen to stories shared by your personal guide, about the life on the mountain farms, trolls, mythological creatures and the Vikings. The tours start and end in Flåm where you will be provided with all the necessary gear for a safe and comfortable experience on the fjords. Spend the remainder of the day at leisure, maybe take a trip to Aurland, only a short ride away on the local bus. The morning is free to enjoy at your leisure, before joining a thrilling snow shoe hike in the afternoon. Your guide will introduce you to the art of walking in snowshoes before you head out towards the Stegastein viewpoint, where you can admire spectacular panoramic views across the Naeroyfjord, a perfect photo opportunity. Today your fjord holiday comes to an end. We can arrange extra nights, if you're not ready to leave just yet or continue your holiday and travel to Northern Norway in search of the Aurora Borealis. Please get in touch and we can create a programme specific to your travel dates.